Microcontrollers have changed a lot in recent times. First there was the 8051 family. Then the PIC, and the big player right now is the many Cortex-M0 devices. It is an ESP32-WROOM-32 module mounted on a development board. The basic specifications of the ESP32 module is a dual core (Xtensa LX6) clocking from 80MHz to a maximum of 240MHz. There's also a low power processor that can do simpler tasks while the main cores are suspended (for enhanced battery life). The main processor has 448KiB internal ROM (for booting and core functions), 520KiB internal SRAM, The WROOM-32 module adds 4MiB SPI flash. There are a number of GPIO pins that offer the usual selection of serial ports (3), ADC (12! ), DAC (2), SPI (3), IIC (2), IIS (2), digital I/O, PWM, et cetera. But what makes this device different is that it also contains an onboard WiFi transceiver supporting 802.11 b/g/n (upto 150Mbps) in the 2.4GHz bands. There's also a Bluetooth Br/EDR/BLE transceiver as well, but it's the WiFi that is the most interesting. Did I mention that it's about seven euros? It's like the well known ESP8266 on drugs! 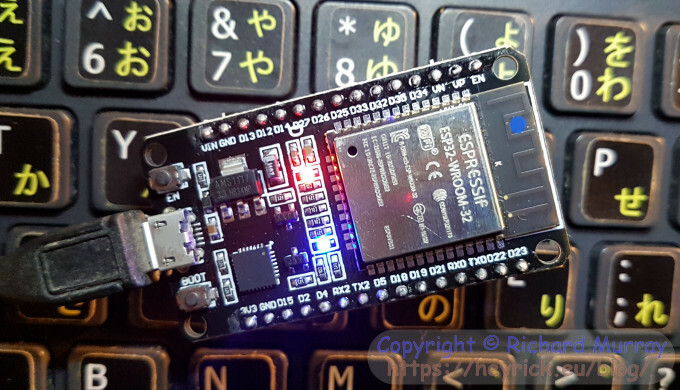 The bigger board breaks out the ESP32's GPIO into something that can be plugged into a stripboard, plus it uses a USB connector to provide power and also to communicate with the ESP32 using UART 0. The ESP32 doesn't have any USB connectivity This is used for programming the device, and also for communicating with it, output for debug messages, etc. There are also two LEDs. A red one (connected to the power, shows the device is on) and a blue one (user controlled, it's connected to GPIO2). There are two buttons, on the left is one marked EN that is used for rebooting the device, and on the right is one marked BOOT that is used to select boot mode (normal boot, or hold it down to enter programming mode for reading/writing Flash/memory). It's not a "proper" SoC because it lacks two things that modern operating systems expect. The first is an MMU. The memory mapping is fixed, and both cores can access the same memory. The second is a video driver/GPU. This can be faked by constructing an image of some sort in memory and pushing it out to an attached display, however we're talking small TFTs and OLEDs. It's worth noting that an 8bpp VGA display (640×480) would require 300KiB memory. That's more than half of what's available, not to mention the time taken to push it to the display using SPI. So, no, this isn't for running an operating system. It's intended to sit quietly and 'do stuff', but things a little more complicated than a bread maker. Unless, of course, you wanted a smart bread maker that could report its status (current temperature, etc) and send you an email you when the bread is ready. That, this device could probably do. Plugging it in showed a red LED. Installing the serial port driver (if necessary, it's a Silicon Labs CP210x UART) and plugging the board in instantly froze my PC. Turns out that I can't have the ESP32 and my USB WiFi dongle active at the same time. Thankfully I bought a switch for my Vonets, so I just plugged the PC's wired ethernet into that. But if your computer stiffs itself, check that there isn't some sort of clash with other USB devices in use at the same time. At this point, a new WiFi access point ("ESP_8BACAD") was seen by my phone. I could connect to it, and was assigned an IP address (192.168.4.2), however there was no response at http://192.168.4.1/ (the AP/gateway address), nor did the device respond to any commands given to it. Interestingly, Colin (RISC OS forum) ordered one that seemed to have an older firmware (responded to some commands and didn't have SoftAP). My firmware appears to have been expected to respond to AT commands given over the serial port, but for some reason this appears to have been be a different serial port than the one the computer would have been plugged into. To make matters worse, it looks as if the choice of which serial port to use is baked in at OS build time, rather than doing something clever like having it start off as the same port, and having an AT command to reassign it (so one could, you know, set the device up after flashing it!). I (1721) cpu_start: Pro cpu up. I (1821) cpu_start: Starting scheduler on PRO CPU. I (72) cpu_start: Starting scheduler on APP CPU. Mounting SD Card: Failed to initialize. Check connection. And there was even a VT100 style full screen editor built in. But I had to ditch this. The Ardunio IDE works on XP. I think it's actually a Java-based toolkit (write once, run everywhere) but this makes it incredibly slow. We're looking at around five minutes to build a small program on a 2.4GHz XP box. Unfortunately, the ESP32 additions are not compatible with XP. Your build will start, and then fail with weird errors that look like they might have something to do with Python. Install the the serial driver if you don't already have it (or another way of talking to your board). Install the Arduino IDE (I used the Windows installer version). Don't run it yet. Open the IDE's folder (probably C:\arduino-1.8.8) and create a folder in there called "portable". This will cause the IDE to place extra definitions and settings there, instead of buried deep in the mess that is "Documents and Settings". Run the IDE. Go put the kettle on while it starts up. In the File menu, choose Preferences. In the window that opens, down the bottom is a long writeable icon marked "Additional Boards Manager URLs". In the Tools menu, go down the the "Board" option (the first one with submenus), it'll probably be some sort of Arduino listed. Open the submenu and click on "Boards Manager...". In the "Filter your search" part at the top, enter ESP and you'll see it'll come up with an entry saying "esp32 by Espressif Systems version 1.0.1" (or the like). Install that. It's pretty big (about 155MiB), so go put the kettle on again. When the board has been installed, go back to the Tools menu and open the Board menu and pick "ESP32 Dev Module". If you purchased a different ESP32, like the DOIT board, choose that instead. The Dev module is for the cheap clones you'll find on eBay, Amazon, etc. The only other thing to do is to set the port to the applicable COM port. When you have done this, open the serial monitor, set the speed to 115200 baud, then press the EN button on the ESP32. You should see output as it boots. Install Python 2.7, ensure it goes in C:\Python27. Yes, I know it's nearly a decade out of date. Stuff refers to version 2.7, so best to install what it expects. You will need PySerial, however newer versions are not XP compatible (refers to unknown API call "CancelIoEx"). So I installed the oldest version of PySerial available. It works, but it's a pre-release build. You might want to experiment to see if a later one works for you? Here is the PySerial installer that I used (v3.0a0). It'll install itself into Python. Using an editor that understands LF terminated files (in other words, NOT Notepad! ), load the file C:\arduino-1.8.8\portable\packages\esp32\hardware\esp32\1.0.1\platform.txt. What we're going to do is remove references to the prebuilt executables, and instead run the Python code directly. At the top, you'll see a number of lines beginning "tools. ", followed by lines beginning "compiler.". In the "tools." lines, look at the ends of the lines for references to ".exe" and change those to ".py". There should be three of them (esptool.exe, espota.exe, and gen_esp32part.exe). That is to say, insert "c:\python27\python " between the "pattern=" and the opening curly brace. Go down a few lines to the "create hex" entry, and do the same thing here. Finally, at the end are two lines for "tools.esptool_py.upload.pattern". We want the one that isn't Linux. Insert the call to Python here as well. Save the updated Platform file. Copy C:\arduino-1.8.8\portable\packages\esp32\hardware\esp32\1.0.1\tools\esptool.py into the folder C:\arduino-1.8.8\portable\packages\esp32\tools\esptool_py\2.6.0. Open a command window in the folder containing esptool.py (if you don't have that tool available, you'll need to CD to that folder. Enter: esptool.py -p COM5 chip_id (replace COM5 with whatever is appropriate for your machine). esptool doesn't run - was Python installed correctly? esptool runs, then bails with an error about CancelIoEx - downgrade to an older PySerial. esptool runs, then bails with lots of stuff that looks like missing files - was PySerial installed correctly? esptool runs but can't connect to the ESP32 - correct COM port specified? esptool can't connect, COM port correct - you may need to hold down the BOOT button until esptool connects. Just hold it and be patient. You should have something saying your chip is an ESP32D0WDQ6, listing its features, then it's MAC address. Something about uploading and running a stub, then a warning that there is no chip ID so it'll return the MAC instead. In the File menu, go to Examples, then ESP32, then AnalogOut, and choose LEDCSoftwareFade. At the top of the window are two faded looking round buttons, a tick and a right pointing arrow. Hover over the tick (it'll say "Verify") and click it. This will compile the "sketch" (in Arduino parlance, programs are called sketches for some reason). Don't put the kettle on. Book yourself a flight to India, go, find a tea plantation, wait for the tea leaves to sprout, pick them, fly back, and then put the kettle on. It's really slow. If you see text in orange, something went wrong. When you are ready to upload your compiled sketch program, click on the second round icon, the right-facing arrow (it'll say upload). It'll take a while to get going. When you see the orange messages about trying to communicate with the ESP32, it's probably time to reach up and hold down the BOOT button. Don't worry if it freezes on uploading 3% or somesuch, there's more output below. Just wait until you see it say "Hard resetting via RTS pin...". Then you'll know the program has been flashed to the device. Something that I noticed is that while the Arduino stuff seems to be fairly well documented, the ESP32 extensions are rather less so. There's a lot of stuff buried in random blogs and articles, and I would imagine possibly in numerous deeply buried header files. But if you look online for things like how to read the onboard temperature sensor, you will find the magic incantations, but... is there an easy to digest list of this stuff around? I presume things will improve. The ESP32 is fairly new (why you won't find many books about it) so maybe better resources will come in time. I think perhaps another problem is that there are two different programming IDEs (Arduino and the Espressif IDF), not to mention a variety of additional language firmwares - I'm aware of Lua and... PicoPython? Something like that. At any rate, for a cheap but reasonably powerful device for "making smart stuff", it's worth considering the ESP32. It's a little more expensive than a Pi Zero but quite a bit less than a Pi (normal). However, it's small number of I/O pins have many possible functions and it runs code backed into an onboard flash, so it's always ready to go. The RTOS boots in no time - your program will be going in way under a second. The WiFi is also extremely quick to connect, and having WiFi/Bluetooth creates interesting possibilities for remote non-wired control, and also for the device to talk to the outside world. I patched together some simple web server code I found online, with the wobbling LED code, to create a server that tells how long it has been running, and the current time, as well as pulsing the LED when connected to WiFi. This one comes to 777974 bytes (59%) of program storage space. Actually, the problem here isn't so much the size of the compiled code, but all the libraries that are included. Looking at the binary in a dump, it seems to me that there's a ton of bloat, such as "/Users/ficeto/Desktop/ESP32/ESP32/esp-idf-public/components/tcpip_adapter/tcpip_adapter_lwip.c" - why on earth does a compiled binary include all the paths? Then, it contains multiple messages like "(Cannot use WRITE_PERI_REG for DPORT registers use DPORT_WRITE_PERI_REG)" && (! ((((((0x3ff42000 + (((1)<1) ? (((1)* 0x1000) + 0x20000) : (((~(1)) & 1)* 0x1000 ))) + 0x80) + i * 4)) >= 0x3ff00000) && ((((0x3ff42000 + (((1)<1) ? (((1)* 0x1000) + 0x20000) : (((~(1)) & 1)* 0x1000 ))) + 0x80) + i * 4)) >= 0x3ff13FFC)) for every single time this sort of thing happens. There're 39 such messages. Having said that, I can connect to WiFi by giving an SSID and password. I can run a webserver by telling it what function to call to output upon a specific URI, and then just "starting" the service. I guess this is the price you pay for libraries that look after everything for you. Here's the code I put together, and you can see it in action (at the moment) if you visit http://heyrick.ddns.net:81/. int visitcount = 0;    // how many views? int resetcount = 0;    // kick a reset? // Function to behave like "analogWrite"
// Worked, so let's output a string in the form "Monday, 37 March 2910, 16:44:20"
tempf = temprature_sens_read(); // bloody fahrenheit! // Something for the server to do? // between 150 and 255, so the LED seems to stall 'on'. So 150 is much better. I figured out how to install the esp-at program onto the device - it's a bit of a faff and you use another serial connection to read/write the AT commands. Now in the download tool there is a lot of writable fields at the top with tickboxes next to them. You need to enter the details from download.config into these fields but the filenames need to be full pathnames. Now select START and press 'boot' on the device. It should now put the program on the device. When the program says FINISH you can reset the device by pressing the 'en' button on the device. You can see output after a reset on the USB coms port but that's not how you interact with the program. If you connect those pins to the Pi serial port my SerialTerminal program should still work with the internal serial ports. Plus, if you use the Arduino IDE to program, it uses esptool so it might be useful to have some experience of how that works. Yes, it seems like you have to install the toolchain and rebuild the firmware in order to alter the serial port used for the AT commands. What a pain! Forget about the download tool there's an easier way. Change the directory to the one containing download.config. with your com port followed by the contents of the download.config file. I don't know if your version of esptool.py uses a unix style file separator or whether that is a peculiarity of the ESP-SDK if not you may have to change the file separator to a backslash. I don't use Arduino - I tend to use Pics. I tried Eclipse IDE but it was too much effort - easier to just use notepad++ and the ESP-SDK bash shell - except looking into included files is difficult. I'm having difficulty compiling esp32-at at the moment. It may be because I'm using a 32bit pc. I think the problem is the python version despite it saying that it has all the python requisites in the makefile output. I wouldn't miss it but how do you work that out? It's still on the espressif.com website. I achieved what I got it for, seeing if SerialUSB could access it given your problems, but I find it the worst programming experience I've ever encountered. The ESP windows 32 bit environment doesn't compile their github sources. The toolchain doesn't compile on armbian so I can't even try the using it there. Everything takes *ages* to compile. It's quicker to compile riscos from scratch than compile the 'hello_world' example. Lesson: don't write messages in a hurry whilst tired. What I meant was the one at heyrick.ddns.net is no longer there - the link won't work any more. As for the ESP32 itself, I rather expect it'll do a Pi - sooner or later a faster better specified model will appear. Maybe with onboard USB or something? "Everything takes *ages* to compile." They need a simple command line compiler written in something normal like C, runs on everything from a 486 up, easily portable to other systems, reads the source and spits out a binary. In, like, 30 seconds on normal machines. As you point out, it's quicker to build the entirety of RISC OS than anything for the ESP32. I'm going to ditch the ESP radio and try rolling my own simpler code by piecing stuff together. I don't relish the idea of how long I'll be twiddling my thumbs while it compiles. Arduino is slow, it does not save intermediate files between sessions. ESP compilers always exist somewhere if you have the knowledge to use them. I was never a fan of ESP because of the effort required to use it. Slow as it is, Arduino makes it accessible. I follow carefuly your mods, and now it compile. But impossible to upload i got "upload.pattern" is missing.